This article originally published in Business Observer. An enterprising group of high school students in rural northern Collier County covet a taste of the business big-time. 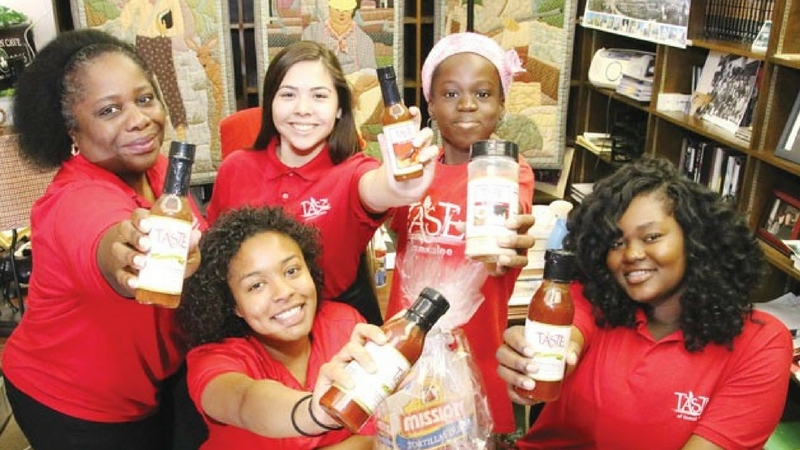 The students, at Immokalee High School, are behind Taste of Immokalee, run under the support of several seasoned Naples area business leaders who mentor the students. Taste of Immokalee sells salsa, hot sauces, spices and barbecue sauces, and its products are in Publix, Winn Dixie and several Naples area independent retailers, including Wynnâ€™s Market. It also has an e-commerce website, http://www.tasteofimmokalee.com. Taste of Immokalee has some other unique features. For one, itâ€™s a benefit corporation, which, under a 2014 Florida law, allows it to pursue both profits and community benefits. Also, the companyâ€™s board of adult leaders includes former college basketball star Ralph Sampson. And Taste of Immokalee recently worked out an unusual capital-raise agreement with Naples-based Tamiami Angel Funds and the Community Foundation of Collier County. Led by Tamiami Angel Funds, Taste of Immokalee seeks to raise $250,000. Taste of Immokalee was founded in 2014, with support from the 1 By 1 Leadership Foundation and grants from insurance giant State Farm. Its mission is to work with students in socio-economically underserved Immokalee, where the population is mostly migrant and immigrant workers in tomato fields. Taste of Immokalee did about $14,000 in sales in 2015, says Capita. That figure jumped to $55,000 last year. The students, a changing roster that averages about 20 teenagers a semester, have worked on social-media campaigns and merchandising activities at local festivals, schools and retail outlets, among other business tasks. If Taste of Immokalee reaches its full goal, the $250,000 capital raise could be a tipping point. It intends to use the money to move its production and packaging from a Sarasota plant to Immokalee, where it can make more goods, faster, Capita says. The funds will also boost the companyâ€™s marketing and branding efforts. And a portion of the proceeds goes back to the Immokalee community. Taste of Immokalee students pitched their company in front of Tamiami Angel Fundsâ€™ investors late last year. While the group was impressed, Cartwright says they were hesitant to invest because the young leadership changes often, when students graduate. Thatâ€™s where the community foundation helps. It set up a special account for the benefit of Taste of Immokalee that allows investors to claim a tax deduction because they donated the shares in the company to the nonprofit foundation. The Florida Legislature passed a law in 2014 that created a new method of incorporating an entity: a B Corporation, also known as a benefit corp. The hybrid between a for-profit and nonprofit gives the companyâ€™s directors the ability to pursue both community benefits and profits. Florida joined about 25 other states that now have a B Corp prevision. B Lab, a B Corp industry advocacy group, estimates there are some 1,600 certified B Corps worldwide, in at least 120 business sectors. The Florida B Corp legislation, according to a Florida Bar Association analysis, has three guiding principles: the entity has a statutory purpose to engage in public benefit activities; a mandate to directors and officers to consider the effect of any corporate action or inaction on the corporationâ€™s public benefit goals; and a mandatory annual report to shareholders describing the efforts of the corporation to achieve the statutory and any specifically adopted public benefit goals.